Otto Tuza’s Vip Horse floats are manufactured to meet our Australian Design Rules and are built to meet our Australian road conditions. For your own safety and legal requirements, you should always check the towing regulations for your State that you will be towing your Horse float in to ensure you meet your own legal obligation when towing your Horse Float. To locate information for your State, follow these links or check the State Government Department responsible for road transport in your State. Proper regular maintenance of your vehicle and Horse Float is essential for your safety. Your towing vehicle and the Horse Float are to be in a roadworthy and safe condition. The trailer’s wheel-bearings, tyres, suspension and brakes are always to be in good working condition. There are a number of safety checks you should carry out before each trip. Check tow vehicle and horse floats tyre pressures, remembering that towing place a lot of additional demands on your tow vehicle. When towing heavily loaded Horse Floats your vehicle tyre pressures should be increased to the level recommended in the owner’s handbook or on the tyre placard, Otherwise, contact a reputable local tyre dealer. 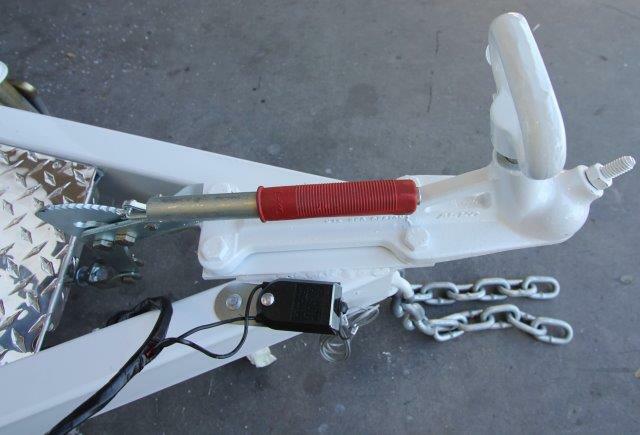 Check the coupling is securely fastened and latched down on the tow ball when the Horse float is connected to your vehicle. Ensure your D shackles are tightly secured and your Humpback split pin is inserted at all times. Check your Vehicle and Horse Floats lights are all working. Make one or two stops before you begin your long trip from a low speed to ensure the Horse Floats brakes are operating properly. Check all doors, hatches and any load or equipment are properly locked and secured. On long trips, repeat these checks every two to three hours when taking a rest stop in a safe location. For more information on safe towing and maintenance, you can also check this out “Safe Towing” PDF published by the Department of Transport and Main Roads.